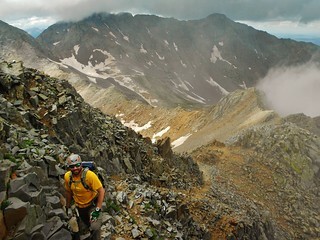 Scrambling on the North Ridge of Wilson Peak. Gladstone and Mt. Wilson are behind me. However, having done Gladstone less than a week prior, and spending a couple days staring at Wilson Peak from the south side, I proposed we do Wilson Peak. Lucky for me, the guys were on board! Strategically, by bagging Wilson Peak now, the next time I was in the area I could focus on El Diente and Mt. Wilson without having to cram all three peaks into one long weekend. One advantage to climbing mountains with fit people is the ability to leave at a more reasonable time, if conditions allow. Yesterday was an 18 hour day, so starting later gave us a few extra hours of well deserved sleep. After 1.5 hours of hiking, we get our first view of Wilson Peak. It’s the dark bump on the horizon. From the same spot as the picture above, I turn around and get this shot of the view. The road bed is full of cobbles, so it’s not exactly easy traveling…watch your ankles! The hiking continues along the road until you reach a spot where there are remnants of an old cabin. From this spot, there is a trail which takes one up to the rock of ages saddle. Upon arrival at the saddle, we were greeted by a female ultra runner. Traveling very light, she had a hydration system, but no windbreaker or other gear. She plowed down into the Kilpacker basin, after saying a quick hello. We were all amazed. 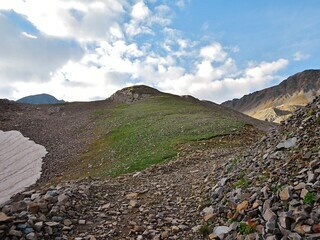 From the Rock of Ages Saddle, the path contours around the Northwest side of the mountain towards the ridge between Wilson Peak and Gladstone. This picture was taken while I was contouring over. 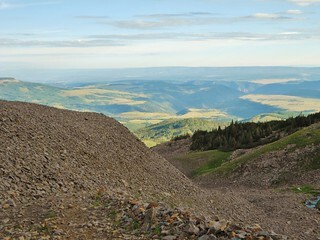 The dirt trail leading up to the ridge can be seen in the distance. Note: It is important not to head straight up the ridge from the Rock of Ages saddle. 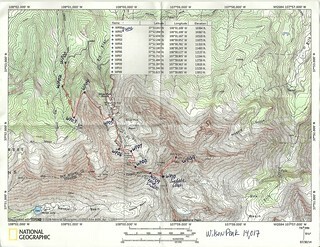 By contouring over to the ridge, you will make much better time and stay on route. When I was just below the ridge, I took this shot of Gladstone (looking West). It was neat to see our ascent route, from the climb last weekend! Here’s a great picture of Mt. Wilson and El Diente! A little something for me to dream about between now and next year! 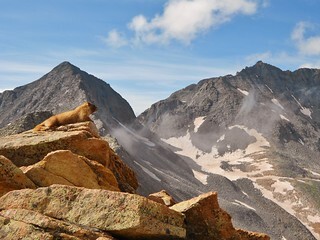 When we arrived at the Wilson Peak/Gladstone connector ridge, we were greeted by this poser Marmot. He clearly has had numerous run ins with hikers…Look at the way he is modeling in this shot of Gladstone and Mt. Wilson! 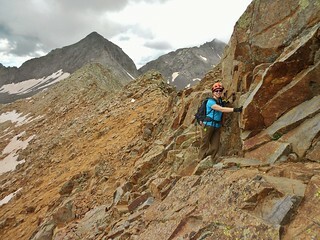 From the connector ridge, one does an ascending traverse over to Wilson Peak’s North Ridge. A couple hundred feet from the summit, the climber transitions over to the east side of the north ridge, from the west. It took us 45 minutes to get to this spot. On the north ridge of Wilson Peak…Seth and Clare scrambling up the final couple hundred feet. This part of the hike was wicked fun. I wish the whole thing were like this bit! 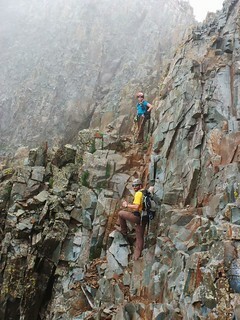 We had a bit of extra challenge as we were climbing in a cloud and the rocks were a bit wet. It took us a little under 4 hours to get to the summit, from the trail head. There was a storm brewing, so we took a couple pictures and then headed down. 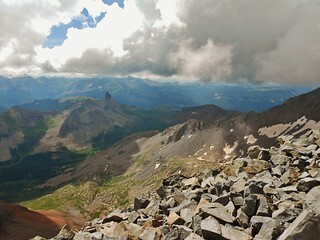 A peek into Bilk Basin from the summit of Wilson Peak. 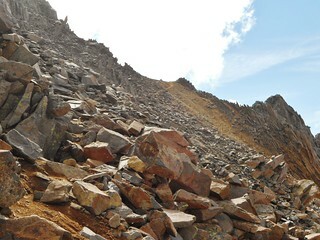 On the way back down the north ridge of Wilson Peak, I got this picture of Seth scrambling down. About 100 feet below him, you can see the dirty flat spot, where you transition to the West side of the ridge. In the distance, Mt. Wilson and El Diente are attracting some gloomy clouds! 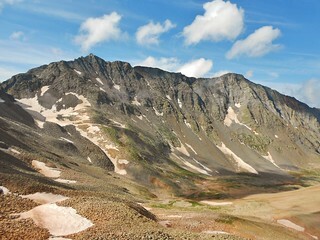 Kilpacker Basin from Gladstone/Wilson Peak connector ridge. To the far right, you can see the trail back to the Rock of Ages Saddle. 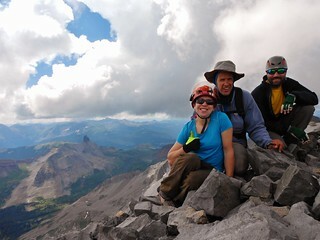 It took us 2 hours to get back into this spot, in the Silver Pick Basin, from the summit. 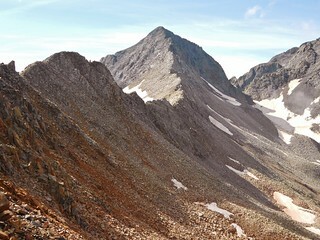 A parting look at Wilson Peak and the Rock of Ages Saddle. It finally started raining, so from here back to the car, between bouts of intermittent sunshine, we got soaked. 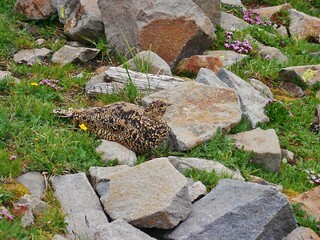 Can you spot the Ptarmigan? Our route with waypoints! 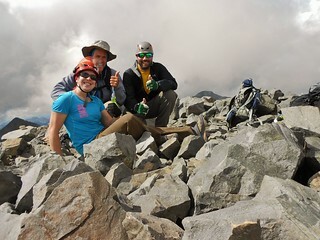 Wilson Peak was a fun mountain to climb; with a fairly innocuous approach hike and some fun scrambling. It was ~4 hours on the way up and ~3 hours on the way down. 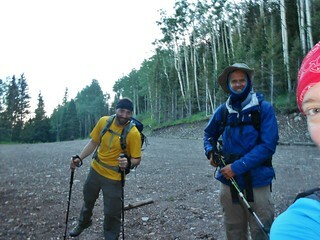 Thanks to Mark and Seth for being such excellent companions, I really enjoyed our banter and time in the mountains! This entry was posted on Sunday, August 3rd, 2014 at 5:12 pm and is filed under Mountaineering. You can follow any responses to this entry through the RSS 2.0 feed. Both comments and pings are currently closed.